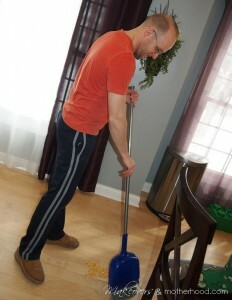 With 3 of the 5 of us sick, our at-home Sunday morning consisted of Sensory Play! We occasionally do sensory play. I even have tons of stuff for it. 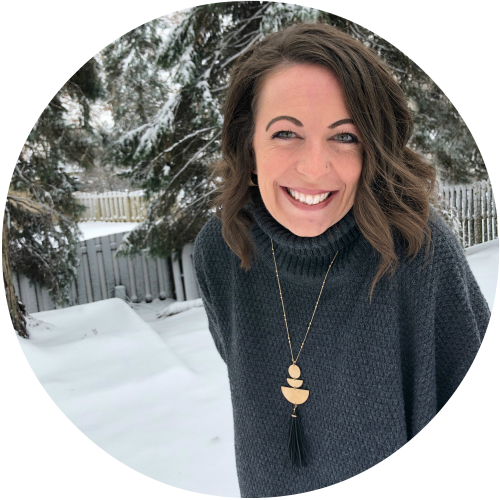 But sensory play often equals messy play which freaks this OCD-ish mom out! 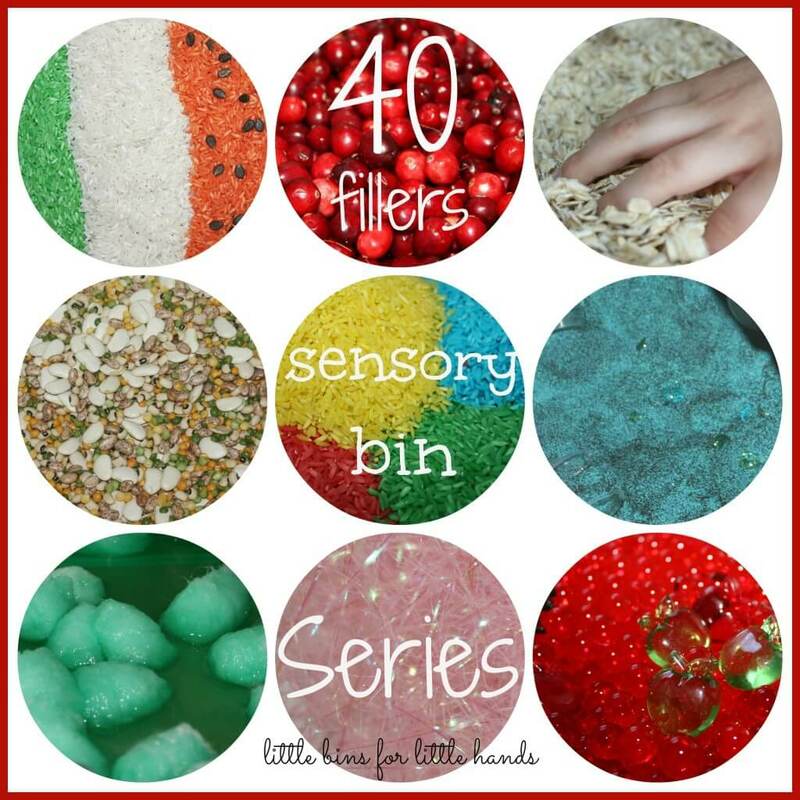 When Little Bins for Little Hands, a blogging friend, sent out an invitation to join in her 40 Sensory Bin Fillers Collaborative Series, I thought this would be a perfect opportunity to stretch us me and get some sensory play going! And I have to say, it was great! At least 40 minutes of quiet play and quality time together! We explored, asked questions, learned through play, and worked on fine motor skills all at once! Our sensory tub filler choice… harvested corn! My husband’s family farms corn and soybeans. So during our visit at harvest time last year, we asked Grandma CC to load us up! And she did with a 4-gallon tote that even included some corn cobs! So I filled up the boys’ bins with 64+ ounces of corn, pulled out an array of farm toys and scoops, and we went to town! We first started with exploring the corn with just hands. The boys have played with corn at Grandma CC’s, but sitting shoulder-to-shoulder with their cousins gives more giggles and pretend play than exploration. So we started from scratch. Dig down in the corn with your hands. What does the corn feel like? Ethan was obviously tickled with this as he’s never played with corn before. 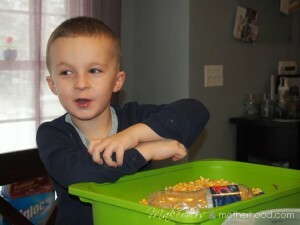 And he seemed to like Daddy pouring the corn in his hand and in between his fingers. Other observations, Dylan said, “It’s so hard I can’t crack it!” and Connor commented on how dusty it is (chaff). Now feel the cob? How does it feel? What can you do with it? The boys thought the cobs felt pokey, but they made great stirs, paintbrushes, and Dylan even said if you stand the cob up, it looks like a Christmas tree. Then we let them pick their toys and go to town. Connor started with his combine because its what he’s seen his cousins do. However, the empty soda bottles quickly became the favorite exploration toy and challenge! 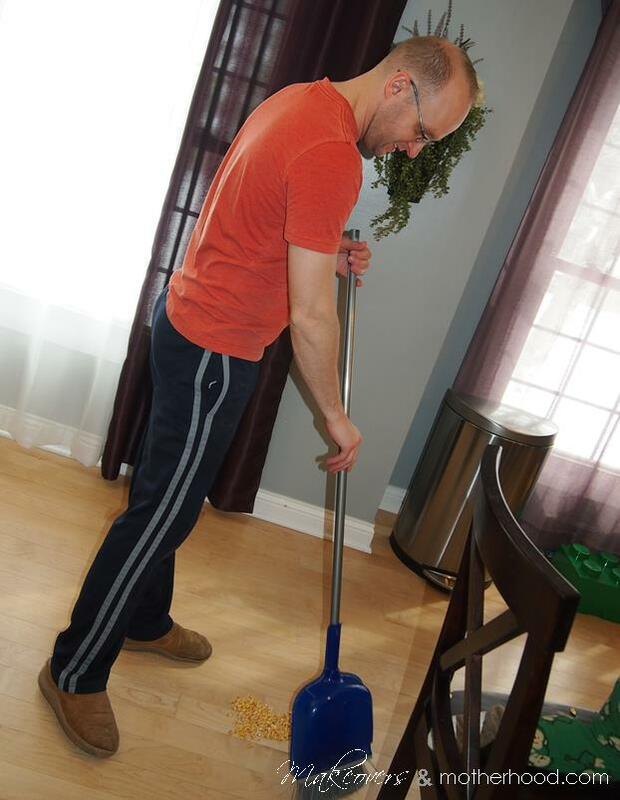 Daddy showed the boys that when they tilt their soda bottle at an angle, if the corn missed the bottle opening, it would stay in the bin rather than fall to the floor. 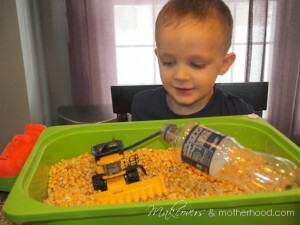 It also seemed to make it easier for the boys to actually pour the corn from their little cups into the bottle. I will say that both my hubby and I were surprised the farm equipment wasn’t a bigger hit, although it did make a comeback later. Daddy even came up with the idea of using the corn head from the combine as a comb to spread or rake up the corn. Connor got corn up his sleeve! He seems to get lots of things stuck in his shirt sleeves and it always makes me giggle watching him wiggle it out. Dylan found he could do a trick and hold his soda bottle up with the combine’s auger. And Ethan was so busy two-handed scooping and playing that he pushed the scoops together so hard that it caused a corn explosion… all. over. the. floor.! Needless to say, unless you already have harvested corn, you’ll have to wait til fall to create this great sensory play activity. So… make sure to pin this in Pinterest and revisit this super sensory idea in September! Our entire family enjoyed our sensory play this morning and the quality time it gave us together! I love the way the corn kernels feel, even I like to play with it!! Looks like your boys had fun! 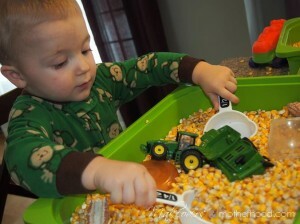 I know a little boy that would LOVE a corn/farm themed sensory bin! Farm toys + scooping and digging = happy little boys! Hope your little one enjoyed! Corn cobs are often sold in bags for deer feed. I will put the cobs in a sensory table and let the children pull the kernels off the cob. It adds a whole new texture as well as fine motor work. Oh how fun! Thanks for the great idea!!!! And, I just had a reader ask where to buy corn if they don’t have access to a farm… so now I know! Thanks! This looks like fun! Hoorah for knights in shining armour, too! I loved their individual reactions, especially Ethan’s! 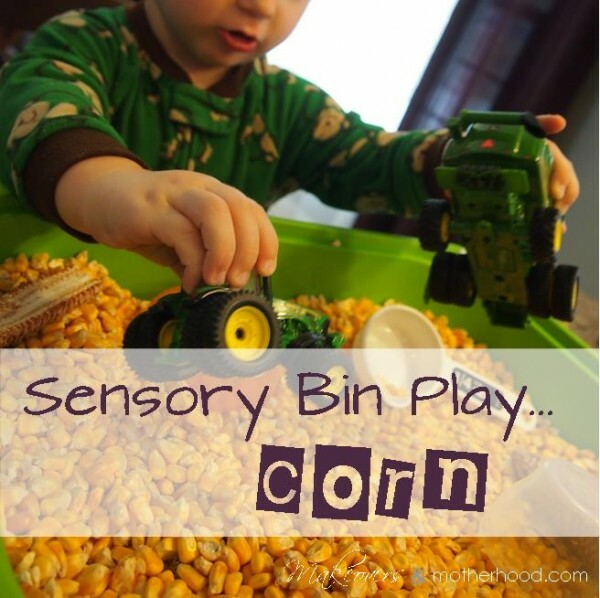 🙂 We’ve never tried corn for sensory play, but it sure looks like fun. My daughter would love the tractors you added the best! Love it! Thank you for joining the series. We enjoy corn play around here too!